Magazines, guidebooks, newspapers and the Internet all tout the best places to eat in Rome, but Sweet Leisure has a better guide. We have direct access to Elizabeth Minchilli, and she has the inside scoop. Elizabeth travels through Italy gathering material for not only her articles, which she contributes to an enviable number of magazines, but also her books—six to date withItalian Rustic (Artisan, 2009) being her latest. Most recently Elizabeth has turned into one of the best resources on eating well in Rome and Italy through her blog, Elizabeth Minchilli in Rome, and through her three best selling apps: Eat Rome, Eat Florence and Eat Venice. Eat Italy is due out in September 2013. Now you can see why she tops the list of friends to call for restaurant recommendations. 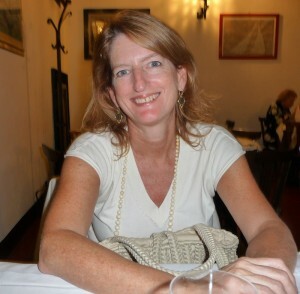 So what are Elizabeth’s current favorite places to eat in Rome? Where would she suggest visitors try if they are headed to Rome? In her own words: “It’s always hard choosing ‘the best’ of anything. While a lot of people complain about food in Rome, I find it’s hard to go wrong when going out to dinner here. In Florence and Venice it’s more difficult to avoid tourist traps (unless you have my apps, of course) , but in Rome, it’s just not that hard to get a good plate of pasta. That said, I definitely have my favorites. The following are the places I go regularly, not in any particular order. I’ve tried to include a few in different neighborhoods since I imagine you’ll be touring around. For more Roman tips, visit my blog. And since my ‘favorites’ change regularly, make sure you come with your iPhone or iPad loaded and ready with my app Eat Rome. 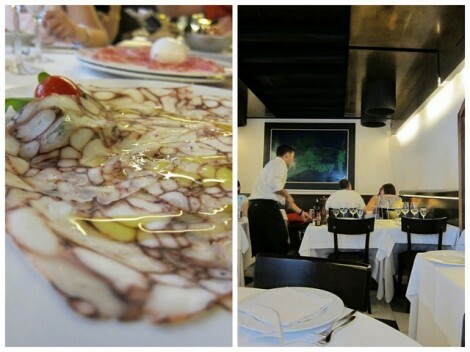 La Gensola is one of the best places to eat the freshest seafood in Rome. The other night we were there and the fish was delivered fresh from the boat, as we sat down at 8:30. By 8:45 we were dining on barely cooked sea scallops drizzled with aged balsamic and pasta tossed with chunks of fresh tuna and pine nuts. Dishes include such hard to find, and artisanal ingredients as saba from Emilia Romagna, collatura from Campania and small white beans from the hills of Lazio. It’s not a coincidence that one of the most successful restaurant openings of the past few years happened in the ever-hipper Monti neighborhood. Walk past a handful of outside tables, to be welcomed by big over stuffed velvet armchairs. Mismatched tables and chairs are scattered over several loft-like rooms, including one that is completely open to the kitchen. There is something for everyone here, since service starts with breakfast and goes into the wee hours. Ingredients are organic and sourced locally, a forerunner of the “Zero Kilometro” or locavore movement in Rome. The menu changes seasonally, but this past fall we enjoyed pumpkin stuffed ravioli and vegetable ‘meatballs’ in a yogurt and pecorino sauce. Don’t miss their lunch buffet, a real bargain at 8 euros. Although it looks very touristy from the outside – red checked table clothes, dripping candle in Chianti bottle, etc.- this is actually a well-hidden secret. Don’t be fooled by the ordinary sounding menu posted by the front door. Chef Alessio always offers about a dozen specials, which are hard to choose from since they all sound so good! My favorite new addition is Fettuccine alla Romana, a pasta take on the venerable saltimboca. Homemade fettucine are tossed with prosciutto, pine nuts and sage. While the clientele is usually an assortment of locals and some tourists, Dustin Hoffman, Al Pacino and Robert De Niro dropped in during the film festival and New York Times critic Frank Bruni and San Francisco chef Gary Danko both recently ordered Alessio’s famous meatloaf. One of my all time favorite roman restaurants. 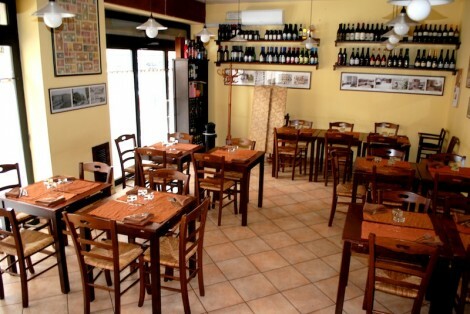 Located in the Testaccio neighborhood, this is a real old fashioned roman restaurant, complete with old grumpy waiters. 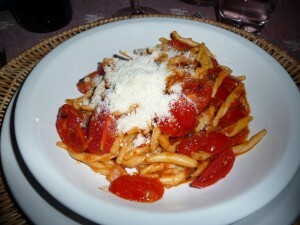 Extraordinary carbornara, amatricana and pagliata (a pasta made with unborn calf intenstines). Meat is also great, including whatever roasts they have that day, as well as various innards. A typical Roman experience. And yes, if I had to pick one last meal, it would definitely be at Perilli. One of my favorites in Rome, although the place has been there for 30 years. Excellent food and wonderful friendly service. Look at the menu, but the specials (which are many) are what you should concentrate on. They usually do pigeon some way, which is always good. Do try the parmesan flan with lettuce sauce (listed under vegetarian dishes) as a antipasto. Also, their big tortolloni with a runny egg yolk inside is fantastic. Don’t miss their apple cake, a sort of pudding, for dessert. You can’t come to Rome without visiting the Coliseum and the Roman Forum. Nerone is one of the handful of truly Roman trattoria that haven’t changed their interiors or their menu in the last thirty years. Offering the classics such as Spaghetti alla Carbonara and Vitello Saltimboca as well as a delicious array of antipasti. If you are lucky, nab a table with a view of the Coliseum, which looms a block away. Start with the self-serve antipasti buffet, which includes classics like grilled zucchini and frittata. 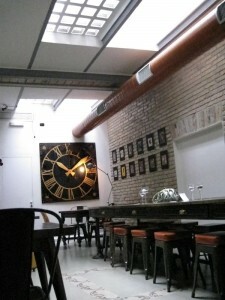 Pizzarium has become a mecca for foodies in Rome, and it’s creator, Gabriele Bonci, their god. Which would all be pretty weird sounding, except that the pizza he turns out is nothing short of miraculous. This is not a pizzeria, but a pizza a taglio place. In other words, the pizzas come out in large trays, and you buy slices to eat standing up (or you can take out). What makes the pizza so great? First of all the dough. Evidently Bonci brought back some ancient yeast starter from Puglia years ago, and has been nurturing it ever since. Here’s the drill: order a little slice of as many kinds as you think you can eat. They will heat them up, then place them on a little wooden board, and cut them into bite sized pieces. Since the pizzas are seasonal, and created at the whim of the Bonci, you may never get a chance to try them again. 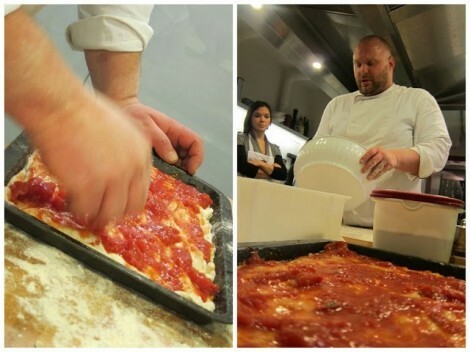 For a fun look behind the scenes, have a look at the pizza making class I took with Bonci. One of my favorite ‘new’ restaurants in Rome. Chef Luciano Sforza puts his own creative spin on classic Umbrian dishes. In a chic but relaxed dining room you can enjoy dishes like Taglierini with Squid and Blud Cheese; Bean and Chestnut Soup and Pork Livers cooked in Sweet Red Wine. His 12 Euro tasting menu at lunch is the best deal in town. The other day I finally made it up the hill to Monteverde, (which does seem to be the new food hub these days) for lunch. L’Osteria Monteverde is part of a new trend in Roman restaurants that I’ve already written about (see my write up of Cesare al Casaletto). Young talented chef and partner decide to take over simple trattoria in neighborhood outside of the (expensive) historic center. Rather than spend time fixing it up into something fancy or new, they focus on the food. So from the outside you really wouldn’t look twice at l’Osteria Monteverde. And inside? Cozy and comfortable, unpretentious and light filled. 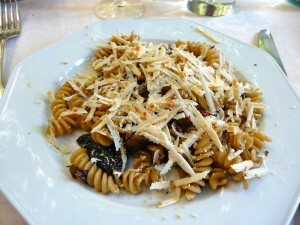 Since it was getting dangerously close to the end of fave season, I ordered pasta with pecorino and fresh fave. The fave had been double shelled (nice touch) and just barely cooked. The paccheri were perfectly al dente, and smothered in sharp pecorino. 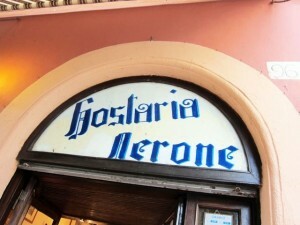 And make sure you save room for their tiramisu, definitely one of the very best in Rome. Pierluigi is not a secret place. It’s not off any beaten track. But I had taken it for granted, like many people do. It doesn’t make it into many of the hot foodie guides, since it’s not new, nor is it rustically charming. Instead, it’s just one of the best places to get some of the freshest fish in town, perfectly prepared, in a beautiful setting, with excellent service. Which is kind of what you want in a restaurant, right? 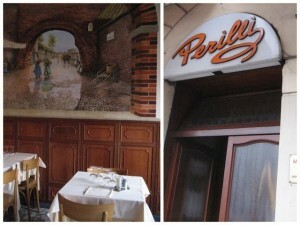 And in fact, Pierluigi is the restaurant that I most often recommend to friends and visitors to Rome. Why? Primarily the food, of course. But also the setting. You’d think it would be easy to find a nice place to eat outside in Rome, that also has good food. But it’s not. Most of the better restaurants have no outdoor seating, and none have as charming a location as this piazza lined with sixteenth century palazzi. But back to the food. While you can certainly eat things other than fish, why bother? Walk inside, and you can see it all on display. Fresh and glistening. I usually go for one of the two house specialties to start. The Soppressata di Polpo is octopus that has been cooked, then pressed into a loaf pan. Once it has ‘set’ it’s sliced so thinly you can see through it, then drizzled with olive oil. If I’m feeling more like a salad, I order the insalata catalana, which is rughetta tossed with potatoes, squid, shrimp and tomatoes. Simple and delicious. This is the place to order Spaghetti alle Vongole, of which they are masters. Thick strands of spaghettoni, bathed in a rich, clammy broth. If you aren’t in a rush then the Risotto a Crema di Scampi is pure indulgence. They make it the old fashioned way, with rich fish broth with the shrimp heads passed through a mill to produce the fishy creaminess. Second? Grilled fish. Always cooked perfectly (never over done) with just the right salty charring on the skin. For more on Elizabeth visit her blog, Elizabeth Minchilli in Rome, where you’ll find links to follow her on Facebook, Instagram, Pinterest and Twitter, as well as a link to sign up for a daily dose of Rome delivered to your inbox. If you’re headed to Rome, she leads delicious Food Tours and Workshops and is happy to prepare custom Culinary Itineraries. Read more about her on Tripadvisor, where she regularly ranks above the Colosseum and St. Peters as the funnest things to do in Rome. AND WHILE IN ROME, DON’T FORGET COFFEE: CLICK HERE AND HERE FOR THE BEST PLACES TO GO.